Remember Ghost Giant? This PlayStation VR exclusive title was first shown off during E3 2018, and it looks like a cute, lighthearted adventure. You play as the titular character, befriending a small boy named Louis as you explore (and probably inadvertently terrorise) his home town. Today, developer Zoink Games announces its partnership with Perp Games, which will handle publishing duties for the upcoming virtual reality game. Ghost Giant will launch with both a physical and digital release in the spring of this year -- at least in Europe. While the region has a release window, no firm date has yet been announced, and it seems that North America will be getting the game a little later. 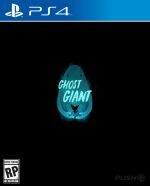 Are you looking forward to getting your glowing blue hands on Ghost Giant later this year? Watch out for furniture in the comments below. That's neat, I'll get the physical copy in that case! Looks sort of like Tearaway VR. Consider me intrigued. Looks super cute, i seem to have a soft spot for cute talking animals in games. Ie animal crossing, night in the woods etc. This looks to be another contender for me! After my experience with Moss I’ll definitely be picking this up!! I hope we get further chapters of Moss too! !